For me, preparation starts on most Sunday evenings. Start to plan and assess the forthcoming week, by doing simple things like looking at your calendar plans for the week for any important meetings or deadlines, to help get a sense of what your week will look like. If you know that the week ahead will be particularly busy in meetings or other deadlines, then be very careful to accept any ‘non-urgent’ tasks – sometimes it is better to say no! Additionally, leave your weekend for family and social events and try to divide the time between late evenings and early evenings at work, so that you can spend quality time at home. This “week ahead view” will also helps to set your intentions and think positively about getting into the office at the start of the week with an action plan, instead of dreading that Monday morning! Early in the morning, write the task list for the day. Whether it is in the form of an (evergrowing!) to-do list, having a hand written list to stick on your desk is an immensely helpful tool to keep your day focussed. Answering emails is a tempting thing to do as soon as you reach the office, but it might be helpful to extract key tasks from emails and add them to your task list. As women, the pain that there isn’t enough time in the working day to take care of unmet family tasks, especially in the West where working hours tend to take a large part of your day. So in order to get tasks done for your family, list down any important family errands on your way to work like ‘call doctors to book an appointment’ or ‘pay bills over phone’. This ensures the family-related duties are completed and are not forgotten in the list of priority tasks for the day. The worst thing is when you have been asked by your spouse or parent to do something and then forgetting to do it, or running out of time. Having an experienced mentor has been invaluable. Most companies and organisations are very understanding and accommodating in giving new employees a mentor to shadow. Having someone who sees your work day in day out and can advise you to improve in certain areas of your career is essential for growth. 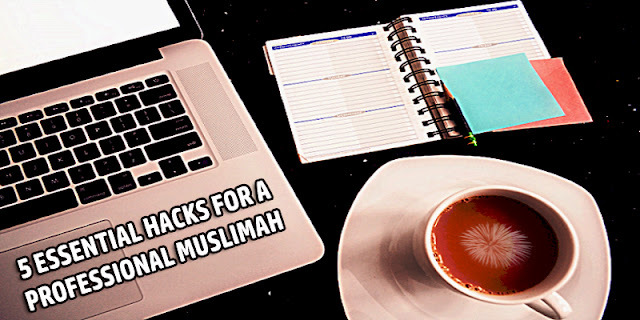 It is essential to make time to pursue your passions and interests outside of work to boost your energy and creativity as a Muslimah! These are what we call ‘passion projects’ which are causes or projects outside of work, usually limited to 3 per year to avoid burnout! Having a hobby (sports, art, reading, knitting, baking, etc.) and volunteering are great projects to pursue, giving you something to look forward to during the working week. Research has shown that when people lead lives with projects they care about without any incentive of being paid, they are motivated to do well in other areas of life including their paid work. Last but not least, the best advice to a working Muslimah would be to make sincere dua to Allah for success in every aspect of your life, for barakah in your time and work, and to make you of benefit to the Ummah. Ultimately, there is no success except by Allah.